It seems in 2017 the movie that has inspired the most varied reviews is, "Alien: Covenant." Whether its fans are encouraging people to watch it again now that it's on Blu-Ray in order to better absorb its message, or other people are saying it is the worst, "Alien," movie ever and the product of a senile Ridley Scott (the director), people had strong reactions to, "Alien: Covenant," and after watching it earlier this week I have come to the conclusion that is actually is pretty good--at least in my opinion. I would say one reason I liked, "Covenant," is that it takes aspects from various movies in the series and meshes them together in a satisfying way. It follows-up on the philosophical aspects of, "Prometheus," which I still defend as underappreciated, has scenes where trooper-esque folk fight a bunch of aliens on an unfamiliar planet (so, "Aliens," being riffed on), and just when you think things are winding down the flick spends the last 20 minutes riffing on the original, "Alien," as a Xenmorph stalks the halls of a big spaceship. It is like Scott took pieces from his other films I enjoyed and decided to mesh them all together in a film that isn't as good as the first two, "Alien," flicks, but comes in a comfortable 3rd place ("Prometheus," and, "Alien 3," kind of tie for 4th and, "Resurrection," continues to be an embarrassing mess of a film with the movies where the Aliens and Predators fight not counting as part of the same continuity, in my mind). 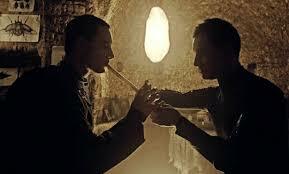 Fassbender is amazing playing two roles. I won't say, "Covenant," is perfect. It takes it a little while to really get going, certain actions taken by characters don't make much sense after later plot-elements are revealed, and besides Michael Fassbender as two different Androids/"Synthetics," none of the cast really stands-out as interesting characters, but there is plenty of good stuff too that makes me really like this movie. There's heaping doses of philosophy, gruesome alien-gore, amazing and lush imagery, and the aforementioned Fassbender just kills it as the friendly Android/"Synthetic," Walter and dangerously-unstable David (last seen in, "Prometheus," and just as deliriously evil as ever), making two robots arguably the characters with the most personality in this movie! From my discussion of what I liked and what annoyed me, "Alien Covenant," is clearly not without flaws, but I think it is a good movie and seeing how some people hate it with a burning passion just kind of befuddles me. I read the comments by everyone who liked the movie and nod my in agreement, but then read the thoughts of those who despised it and find myself confused by how the things they scorn tend to be what I found cool. It is normal for everyone to have different tastes and for every person who has a favorite movie that movie is most likely someone's most-hated film, but it just startles me how much of a divide there is between everyone in regards to, "Alien: Covenant." 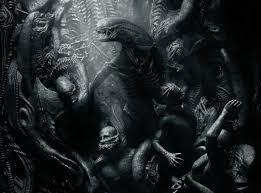 Regardless of all the mixed feelings I thought it was a damn fine movie and a solid addition to the "Alien," legacy. I give it 4 out of 5 stars. Should you want to buy a copy for yourself you can always use Amazon.